© Preserved BSK now mounted on Commonwealth bogies at Didcot. This guide is intended to provide a basic overview into British Railways’ use of Crimson Lake and Cream (CLC) for its corridor passenger carrying stock and the locomotives that hauled that stock; a colour combination quickly nicknamed ‘Blood and Custard’ livery. For many, ‘Blood and Custard’ was a fine combination of colours and was particularly suited to the new Mk1 stock. In general Crimson Lake was used for locomotive hauled non-corridor stock. The erroneous term ‘carmine’ did not appear to be used by British Railways in respect of Crimson Lake. British Railways came into being on 1st January 1948 but in respect of liveries no clear policy had been decided. Accordingly, the individual works carried on as they had always done, painting rolling stock in their own liveries. The only indication of the new ownership was ‘BRITISH RAILWAYS’ being substituted for the former Company Titles on the sides of locomotives, soon followed by the re-numbering of locomotives into block sequences based around the newly created regions. In terms of the font used to display ‘BRITISH RAILWAYS’ on locomotives former SR classes utilised Bulleid’s ‘sunshine’ lettering, LNER Gill Sans, LMS a mixture of LNER Gill Sans (initially in white thence off-white /cream) and bold Sans-serif whilst GWR used Egyptian-style in metallic gold or yellow with red drop-shadow and black outlining /detail. Upon nationalisation British Railways was divided into geographical regions; these being based loosely around the pre-nationalisation ‘Big Four’ companies with the exception that Scotland became a single region on its own and the former LNER was divided into Eastern and North Eastern Regions. As white lettering on a tangerine background was sometimes difficult to read the white letters on station names (except totems) were often outlined in black. The colour of freight rolling stock followed a national standard; essentially grey for unfitted and bauxite for fitted. Black was used engineering stock (gulf red was introduced around 1960 followed by olive). By 1950 steam cranes and match wagons were being outshopped in black (some in lined black) until ‘General Instruction 10 – Covering the repainting and treatment of ... breakdown cranes and other service stock’ issued July 1959 stated repaints should be in bright red with white lettering (this followed the recommendation towards a more distinctive colour from the 1955 Danske Statsbaner report on ‘Railway Re-organisation of Breakdown Equipment’. In respect of ‘Blood and Custard’ livery the use of ‘carmine’ does not appear to have been used by British Railways and seems to be a simple misnomer, possibly from the London and North Western Railway’s 'plum and spilt milk' livery; a version of this livery that was trialled by British Railways in 1948. This LNWR livery was described as having lower panels and mouldings in a 'carmine lake', the upper panels were a shade of white. Carriage ends were painted chocolate with black underframes /running gear. The fixed window frame mouldings were usually ‘Indian red’ with door and drop lights in varnished wood. Certainly on the Southern nine Bulleid and three Maunsell coaches (used on the 7.20am from Waterloo to Bournemouth West and the 3.30pm return) received ‘plum and spilt milk’ as a livery before repainting into Crimson Lake and Cream. These included restriction ‘4’ Maunsell Coaches 1200 and 1254 (both high window TK vehicles) as well as 7224 (low window FK) strengthening SWD Bulleid sets 3-set 299 and 6-car dining set 788 (this set often being strengthened with additional vehicles placed within the set) #2. Three-compt Restaurant 1st plus sal. The Eastern also trialled in this livery (on the former Great Eastern) as did the Western in a fifteen coach ‘Riviera’ set; there may have been more around the regions. 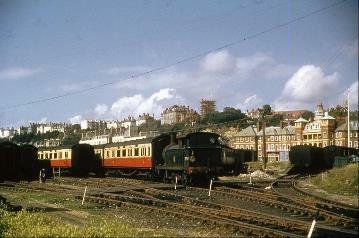 On the Southern Region Maunsell SED set 237 trialled Chocolate and Cream livery between 1948 and 1953 #3. Neither Plum and Spilt Milk or Chocolate and Cream found favour and British Railways made the decision to adopt Crimson Lake and Cream. Ironically Chocolate and Cream was subsequently adopted by the Western Region in 1956 for certain trainsets. ü Crimson Lake for local steam services and passenger train vans. ü Green for multiple unit electric coaches. Lancing Carriage works was releasing repainted stock in SR Green early February 1949 with Crimson Lake (and Cream) appearing at least by March 1949. The Cream had a British Railways paint code but does not appear to have had a British Standard colour reference. Crimson Lake was the designation appearing in the records of Lancing Carriage works; Crimson Lake and Cream livery being coded CLC; Crimson Lake being CL. The cream was normally bordered by black and gold lining. Lining comprised 3/8” gold and 3/4” black lines; the latter adjoined the cream painted panel. On a Mk1 coach the cream panel was 3’ 6 ½” deep. Over time the paint and its varnish weathered, it was subjected to different production patches, uneven cleaning and fade. That if did not wear well in service was a significant factor in its demise. Differences in colour photographic film (let alone lighting levels /camera shutter duration etc) would lead to questions as to the exact colour of crimson lake. Ultimately the British Standard has to be referred to being a clear definition of the colour as intended by the Railways Executive. British Railways’ Mark I prototypes coaches arrived in 1950, followed in 1951 by the first production coaches. For Mk1 locomotive-hauled stock the specification was generally simple to adopt; corridor coaches receiving ‘Blood and Custard’ livery and non-corridor stock received crimson lake. However, on the railways ‘exceptions’ frequently arise and some batches of ‘BG’ full-brakes received plain crimson lake. Indeed, this general overview will miss out a number of ‘exceptions’! On the Southern there were variations in the application of Crimson Lake and Cream livery with some coaches (for example set 453) having a broad band of crimson above the windows; others none at all. Some coaches were repainted from Southern Railway green straight into (post-1956) Southern Region green without receiving Crimson Lake or Crimson Lake and Cream livery. For example, Maunsell rebuild of LSWR 48’ non-corridor third S320 (now preserved on the Bluebell railway and modelled in 4mm by Hornby) retained Southern green until repainting into BR green at Lancing on 4th October 1956 (works release date). Multiple unit stock was generally (but not always) green livery and Pullman cars retained their Pullman livery. On the locomotive front, although in 1948 ‘BRITISH RAILWAYS’ started appearing on the sides of steam locomotives this was rapidly replaced by the ‘Lion and Wheel’ crest also nicknamed the ‘Unicycling Lion’. Derived from the British Transport Commission Crest this comprised a gold /yellow lion stretching over a railway wheel, which in turn had a ‘British Railways’ nameplate across its centre. Initially the crest came in three sizes (26.5” wide, 15” wide and 8.5” wide) although examples of the latter use appear to be scarce. The lions faced forward with the locomotive; something that would later cause embarrassment with their replacement design. More comprehensive information on British Railways ‘Lion’ Emblems can be found on this website Lions and Wheels (British Railways’ lion emblems, 1949-1964). In March 1949 a decision was announced to paint express steam locomotives in lined blue livery before lined ‘British Railways’ green (passenger), lined black (mixed traffic) and plain black (freight) became the norm from early 1951. At least two shades of the blue were trialled and even purple was experimented with. Most early diesel locomotives were black. It is stated that whilst British Railways’ green appears close, it was not quite the GWR’s ‘Brunswick’ green (which was achieved through using multiple layers of paint). However, the Railway Correspondence and Travel Society (RCTS) identify British Railways ‘Britannia classes’ as being ‘Brunswick’ green; speculation may be that any differences may simply have been in terms of the differences in painting technique. Blood and Custard (Crimson Lake & Cream) was not to remain, for in March 1956 two corridor seconds appeared trialling single-colour livery variations and by May 1956 two new Derby-built coaches appeared in lined maroon. British Railways had decided to discontinue the upper cream panels (a major factor being uneven cleaning) and regions were able to adopt regional colour schemes. In the same year 'second class' was abolished; third class was subsequently renamed second class. In July 1956 the Southern Region rapidly reverted to using green livery on its repaints having painted (it is estimated) some 60-70% of its fleet. This would appear to be in line with the Southern Region’s 10-yearly painting (on E4 repairs) /2 ½-yearly varnishing cycles (on A2 Repairs)+. However, when permission was given for the Southern Region to return to Green for its Corridor Passenger stock it embarked on a programme to repaint at the A2 repair for a number of vehicles in order to accelerate the return to Green. Also in July 1956, Mk1 coaches S9 and S80009 were amongst the last coaches to leave Eastleigh in Crimson Lake & Cream (Blood and Custard) livery. At Lancing Carriage Works the first BR Mk1 3-Sets to be painted CLC to Green (G) on A2 was Set 566 which was outshopped on 12th and 13th May 1959, quickly followed by Sets 568, 544 and 529. 5-Set 271 was the last set of Southern Railway origin to be repainted CLC to G on A2, with the last vehicle being outshopped on 25th March 1959. + Previously the Southern Railway had an eight-year painting /two-yearly varnishing cycle. * In terms of the use of green livery on the Southern carriage roundels were almost exclusively the preserve of multiple unit motor coaches and special carriage sets such as the Ocean Liner formation. It must be noted that when ‘foreign’ maroon liveried coaches were transferred onto the Southern they were usually very rapidly repainted green. Ironically some Southern Region Mk1 coaches that were redeployed onto the Midland Region remained in green livery as late as 1969. Although by the late-1830s a three-class passenger system had become the norm for railway companies, by 1860 second class was already in decline. For example, the Midland Railway abolished second class on 1st January 1875; the Great Western Railway in 1910, the London and South Western Railway in 1918 and the South Eastern and Chatham Railway in 1923 (the last UK railway company to provide it on main line services). Essentially the demise of second-class railway travel was down to the increased quality of third-class accommodation (leading to a consequential increase in its patronage). Provision of second class was simply no longer economic and the London and North Eastern Railway’s suburban services stopped second class in 1938. This left just the Southern Railway operating second class on its boat trains (in line with the corresponding continental services) through into 1948 and nationalisation. However, the Railway Regulation Act of 1844 required a third-class service to be offered so on Sunday 3rd June 1956 it was second class that was abolished on British Railways (it had already ceased on the corresponding continental boat train services). Following its abolition, third class was simply renamed second class and any pre-nationalisation figure ‘three’ on coach sides were removed when they came in for repair. The prices and accommodation were unchanged. In 1987 British Rail rebranded second class as ‘standard class’. In 1959 the British Transport Commission issued a directive that any coach over thirty years old must be withdrawn. On the Southern Region this led to significant stock shortages with previously-withdrawn coaches being reinstated before significant withdrawals took place in 1961. During 1959 maroon non-gangway stock started receiving lining and in 1960 the Southern Region first used the UIC cantrail banding (yellow above first class and red above dining cars) to its (green-liveried) boat-train coaches. By 1963 this convention was being applied to all carriages across BR; usually when they went in for scheduled works. There is no indication of the UIC banding being added to Blood and Custard coaches although some Blood and Custard coaches have received the yellow ‘first class’ cantrail band in preservation. The Southern Region’s expert varnishing techniques along with the use of fixed coaching sets (denoted by 6” high numbers on the set ends) and their associated maintenance regime may well have assisted in prolonging Crimson Lake & Cream livery on Mk1 sets into the early 1960s. On the Southern Region’s Eastern District Some non-corridor vehicles also retained Crimson Lake, for example sets 549, 655 and 723 in June 1960 (compared to green set 660) although the last of the Maunsell corridor stock was repainted green in 1959. Although yet to be substantiated by painting-date records, Blood and Custard Mk1 coach sets have reported as being in service as late as 1963 (single coaches even in 1964) although the number of Blood and Custard Mk1 coaches appears to have rapidly diminished after 1959. Odd Blood and Custard coaches were reported as being on the Western Region in 1963 with the RCTS reported that Mk1 CK W15622 was still in Crimson Lake & Cream in February 1964. Mk1 locomotive-hauled coaches were still being built right through into 1964 (Southern Region Mk1 emus were still being build much later) so many Mk1 coaches arrived too late for ‘Blood and Custard’ livery. However, one RMB (of 1960s build) received ‘Blood and Custard’ livery in preservation. With the introduction of spray painting at Eastleigh Works, coach ends started to became the same colour as the bodywork from 1964. With both ‘Blood and Custard’ (crimson lake & cream) and BR(W) chocolate /cream liveries now obsolete this only appears to have been applied to green and maroon stock until 1965, when British Rail introduced its ‘corporate blue’ identity. It was around this time (1964) that the BR(S) finally obtained some full brakes (BG) in Green livery and even then, only three can be identified. The Western Region adopted chocolate and cream for its named express trains; possibly a slightly ironic decision given the decision to abolish cream! The Western Region used chocolate and cream until 1962 when it followed the other regions and adopted maroon livery for most of its hauled-coaching fleet. Generally, these chocolate and cream coaches sported carriage ‘roundels’; useful for identifying them in black and white photographs when compared to crimson lake and cream. 1956 also saw the use of ‘D’ prefixes on diesel locomotives and the decision to replace the ‘unicycling lion’ crests with the ‘Ferret and Dartboard’. However, many steam locomotives survived with their ‘unicycling lion’ into the 1960s and withdrawal. For example, the Southern Region’s USA tank No.30069 early crest survived at least as late as February 1966. Printed in just two sizes (43.75” wide and 30.25” wide) the ‘Ferret and Dartboard’ was essentially a lined circle surrounding a red lion sejant rampant sitting in a crown holding a wheel. In turn this was placed between lined boxes – the left stating ‘British’ and right, ‘Railways’. On coaching stock a variant was used essentially comprising lined circle ‘carriage roundel’ but with ‘British Railways’ appearing in a circle around the lion sejant rampant sitting in a crown holding a wheel. Britannia Class no.70016 ‘Ariel’ (of Laira shed) was recorded by the RCTS as being the first locomotive to receive the new ‘Ferret and Dartboard’ crest; being displayed at Marylebone station on 21st June 1956. Other Britannia classes (70004 of Stewarts Lane /70023 of Old Oak Common and 70048 of Holyhead) also received this new crest during 1956. On the Southern Region new Standard 4MT no.80153 left Brighton works in February 1957 with ‘unicycling lions’ but a month later no.80154 (the last of its type) emerged sporting the new ‘ferret and dartboard’ crests. Another early example of the ‘ferret and dartboard’ crest was ex-Ashford Works U-class mogul no.31612 (May 1957). An example from the Western Region was Caerphilly Works where its first locomotive to receive the new ‘ferret & dartboard’ crest was 5600-class 0-6-2T no.5690 ex-works in March 1957. Of further interest, previously black Western Region passenger engines (such as the County class) had started appearing in lined green from June 1955 (‘modified’ Halls from September 1955) with the early ‘unicycling lion’ crest. Interestingly plain green Standard 3MT no.82007 was carrying large ‘unicycling lion’ crests in January 1957. Unsurprisingly application dates for the new ‘ferret and dartboard’ crest differed between both regions and works. Originally all lion crests faced forward but this emerged to be a major blunder as Heraldic convention decrees that as the lion faced left on the official British Transport Commission Crest, it must always face that direction on any emblem or logo derived from that crest. Accordingly, British Railways bowed to representations from the College of Heralds so from 1959 the lions had to face just one direction, left. Not only did this decree apply to locomotives but also to carriage roundels although presumably right facing carriage roundels were only going to be applied to certain locomotive classes. However, locomotives and coaches were rarely corrected until a repaint took place; many simply saw their ‘incorrect lions’ remain in place until withdrawal. This lion is often referred to as the rampant lion but in heraldic symbols a rampant lion would have its forepaws raised (like the lion sejant rampant) as well as a hind leg. Although the crown obscures the hind feet of British Railway’s lion, its right hind leg should still be partially visible above or even through the crown; that is not suggests that the lion is probably sitting and is therefore most likely ‘segant rampant’ (also referred to ‘demi-rampant’ or ‘segant erect’) and not merely ‘rampant’. On the Southern Region carriage roundels were normally only applied to the motor-coaches of multiple-unit stock and special coaching sets such as ‘The Royal Wessex’. Elsewhere they were normally applied to lined maroon coaches and the Western Region ‘chocolate and cream’ coaches. There were of course the many exceptions not detailed here! Accompanying these changes to coaching stock, diesel locomotives were generally green although other liveries were experimented with (for example on TOPS classes 31 and 52). Many of the Western Region hydraulics (TOPS class 42/43 & 52) appeared in maroon livery and (from their introduction in 1959) the Midland Region’s AC electrics sported blue with a cast aluminium lion sejant rampant (no encircling ring - similar to British Railways’ cap badges). Furthermore, black had been discontinued on diesel shunting locomotive repaints. Some experimental liveries were also trialled but the future appeared to be with AC and blue livery; Glasgow’s suburban AC ‘blue trains’ first entering into service in November 1960. Unusually the Southern Region’s new type HA electric locomotives (class 71 under TOPS) entered service with a red /white /red stripe along their green bodysides. However, these stripes were removed from February 1963-on when the locomotives started entering works to have cantrail gutter-strips added. On the third-rail Southern Region OHLE electrification flashes have been reported on Bulleid pacifics in June 1960 (nos. 34003 /5 / 16/ 17 /21 /22 & 25) and former SE&CR H-tank 31518 by August 1960 with depots 73A and 73B appearing to lead the way with the introduction of 750v OHLE in yards. The first yellow warning panels on the front of diesel and electric stock appeared in the early 1960s; an early example being Southern Region no. E6001 (Type JA) in 1962 - before it was repainted with a plain green front! However, it was not long before other new locomotives (such as the BRCW class 27) were being delivered with yellow warning panels. On the Southern Region some 4 SUB electric units received yellow warning panels in 1962 with the first EPBs gaining theirs from November 1963 onwards. As an experiment one of the Southern Region’s Hastings Diesels motor coaches (set 1018) appeared with an experimental central yellow panel (solebar to cantrail) covering the middle (vertical) panel of the cab front. However, it was not long before the decision was made to applying full yellow ends to all main-line diesel and electric stock. Some Eastern Region units also trialled this yellow panel; this included (within its gangway end) a lined maroon 1962-built ‘Clacton’ AM9 AC electric unit. At a British Railways Board meeting on 10th June 1966 the decision was made to adopt full yellow ends. During November 1966 the BR Design Panel ratified this decision in respect of corporate blue livery. However, some Southern Region units were still receiving yellow warning panels in 1966/67 even after other units were being outshopped with full yellow ends; these yellow warning panels often being hastily applied. In recent years trains had to be equipped with high intensity headlamps so only a metre square yellow warning panel became mandated (apart from kettles which were never required to have yellow warning panels) and in 2017 Network Rail Infrastructure Limited removed the requirement (under certain circumstances) to have any yellow warning panel. British Railways was rebranded British Rail in 1965 with its new ‘corporate’ blue livery. Like ‘Blood and Custard’ livery, blue and grey was initially applied to ‘Inter-City’ mainline locomotive-hauled stock (the last maroon MK1 received blue /grey in 1974) with plain blue initially on suburban and multiple unit stock. As an aside any remaining 'Ladies Only' compartments vanished in 1977. Corporate blue represented British Rail’s new modern image and the livery was not normally applied to steam locomotives. However, like everything else on the railway exceptions existed in the form of the narrow-gauge Vale of Rheidol steam engines in plain blue with British Rail ‘arrows of indecision’ adorning their sides; coaches were plain blue. On the Southern Region main line stock such as the Hastings Diesel sets and the Bournemouth electrification 4 REP and 3/4 TC units initially received plain blue as the Southern did not operate services falling under the ‘Inter-City’ branding. However, a subsequent decision was made to adopt blue /grey livery for the Southern Region’s express services. In many ways the wheel had almost come full-circle as many facets of Blue and Grey livery (and its application) mirrored ‘Blood and Custard’. To commemorate the end of steam on British Rail the 11th August 1968 saw the ‘Fifteen Guinea Special’ excursion; the last main-line passenger train to be hauled by steam (running from Liverpool to Carlisle via Manchester) before the next day’s steam ban came into force. Running as 1T57 its BR Mark 1 carriage formation was as follows. Motive power used was 45110, 70013, 44781 and 44871. Forty years later in 1996 ‘Blood and Custard’ livery was resurrected when Strathclyde PTE made the decision to repaint some of their Class 156 dmus into a crimson and cream livery. Even the numbers were applied in gold in the original gill sans typeface – these units looked superb! In time some of Strathclyde PTE’s class 314 emus were similarly painted in ‘Blood and Custard’. The information provided on this website is accurate to the best of our knowledge; much coming from works records (such as Lancing Out Book and Waterloo Set Card). However, whilst these works records are usually highly accurate and reliable, BloodandCustard is aware other sources aren’t always so and errors may arise. In the course of compiling this guide we have found numerous errors in books with photographic caption dates (when compared against works records - the ‘definitive source). Whilst we endeavour to correct errors occurring this guide in a timely manner, it is recommended that users of this guide undertake an independent verification of the information thereon. Contributions to the above are welcomed; especially if this overview is missing details or has errors. Thanks go to G. Woods, J. Atkinson & A.F. Brookes.